Cutting of the queue in 1911 The end of imperial rule was followed by nearly four decades of major socioeconomic development and sociopolitical discord. The initial establishment of a Western-style government---the Republic of China---was followed by several efforts to restore the throne. Lack of a strong central authority led to regional fragmentation, warlordism, and civil war. The main figure in the revolutionary movement that overthrew imperial rule was Sun Yat-sen (1866--1925), who, along with other republican political leaders, endeavored to establish a parliamentary democracy. They were thwarted by warlords with imperial and quasi-democratic pretensions who resorted to assassination, rebellion, civil war, and collusion with foreign powers (especially Japan) in their efforts to gain control. Ignored by the Western powers and in charge of a southern military government with its capital in Guangzhou, Sun Yatsen eventually turned to the new Soviet Union for inspiration and assistance. The Soviets obliged Sun and his Kuomintang (Guomindang, Nationalist Party). Soviet advisers helped the Kuomintang establish political and military training activities. But Moscow also supported the new Chinese Communist Party (CCP), which was founded by Mao Zedong (1893---1976) and others in Shanghai in 1921. The Soviets hoped for consolidation of the Kuomintang and the CCP but were prepared for either side to emerge victorious. The struggle for power in China began between the Kuomintang and the CCP as both parties also sought the unification of China. A major political and social movement during this time was the May Fourth Movement (1919), in which calls for the study of “science” and “democracy” were combined with a new patriotism that became the focus of an anti-Japanese and antigovernment movement. Sun’s untimely death from illness in 1925 brought a split in the Kuomintang and eventually an uneasy united front between the Kuomintang and the CCP. Books: 1) The Boxer Rebellion by Diana Preston; 2). Autumn in the Heavenly Kingdom China, the West, and the Epic Story of the Taiping Civil War by Stephen R. Platt (Alfred A. Knopf, 2012). Platt is an associate professor of history at the University of Massachusetts, Amherst. 3) God's Chinese Son by Yale's Jonathan Spence is also about the Taping Rebellion. Other Books from the period. The Opium War: Drugs, Dreams and the Making of China by Julia Lovell (Picador, 2011); 2) China: Alive in the Bitter Sea by Fox Butterfield; 3) China: A New History by John K. Fairbank; 4) China's Imperial Past: An Introduction to Chinese History by Charles O. Hucker; 5) In Search of Modern China by Jonathan D. Spence; 6) The Chan's Great Continent: China to Western Minds by Jonathan Spence (Norton, 1998). 7) Cambridge History of China multiple volumes (Cambridge University Press); 8) The Last Emperors: A Social History of the Qing Imperial Institutions by Evelyn S. Rawski (University of California Press, 1999); 9) Sea of Poppies by Amitva Ghosh (Farrar Straus Giroux, 2008) is a novel set during the Opium Wars mostly in India but also in China that was shortlisted listed for the Man Booker Prize. You can help this site a little by ordering your Amazon books through this link: Amazon.com. The Qing Dynasty was brought down by a highly organized revolutionary movement with overseas arms and financing and a coherent governing ideology based on republican nationalism. Failure of reform from the top and the fiasco of the Boxer Uprising convinced many Chinese that the only real solution lay in outright revolution, in sweeping away the old order and erecting a new one patterned preferably after the example of Japan. “The republican revolution broke out on October 10, 1911, in Wuchang, the capital of Hubei Province, among discontented modernized army units whose anti-Qing plot had been uncovered. It had been preceded by numerous abortive uprisings and organized protests inside China. The revolt quickly spread to neighboring cities, and Tongmeng Hui members throughout the country rose in immediate support of the Wuchang revolutionary forces. By late November, fifteen of the twenty-four provinces had declared their independence of the Qing empire. A month later, Sun Yat-sen returned to China from the United States, where he had been raising funds among overseas Chinese and American sympathizers. On January 1, 1912, Sun was inaugurated in Nanjing as the provisional president of the new Chinese republic. But power in Beijing already had passed to the commander-in-chief of the imperial army, Yuan Shikai, the strongest regional military leader at the time. To prevent civil war and possible foreign intervention from undermining the infant republic, Sun agreed to Yuan's demand that China be united under a Beijing government headed by Yuan. On February 12, 1912, the 6-year-old child emperor of the Qing Dynasty abdicated, ending more than 2,000 years of imperial rule in China. On March 10, in Beijing, Yuan Shikai was sworn in as provisional president of the Republic of China. China marked the centennial of the Wuchang Uprising with the release of "1911", a big-budget historical movie directed by Jackie Chan, and a new museum in the central metropolis of Wuhan where it began. But the celebrations were muted, particularly compared with those that marked the 90th birthday in July of the ruling Communist Party. That, say experts, is because of the troublesome connotations with democracy and Taiwan. October 10, the day the Wuchang Uprising began, is celebrated as Taiwan's national day. "The (Communist) party will play up the ability of the people to throw off the yoke of imperialism, that the people have stood up, and day by day China is becoming a superpower," Willy Lam, an expert on Chinese politics at the Chinese University of Hong Kong, told AFP. "But they will not want to discuss the democratic element. The emphasis is on wealth of the people and international power." Beijing believes it is heir to Sun's legacy and argues that a dramatic rise in living standards during the past 30 years of economic reform is the fruit of his revolution. But the ideological battle between the Nationalists and Communists continues over whether the Xinhai Revolution ushered in a truly republican form of government in China. "The eruption of the Xinhai Revolution overthrew several thousand years of imperial rule and has had a huge impact on the psychology of the Chinese people," historian Lei Yi of the China Academy of Social Sciences told AFP. "The Communist Party believes that they are continuing the spirit of the Xinhai Revolution and that the Nationalists betrayed the revolution." Qin Yongmin, a Wuhan resident who was released last year from a 12-year jail term for subversion, argues that the revolution only replaced one dictator with another. "I do not have a very high appraisal of the Xinhai Revolution," Qin, who was jailed in 1998 after calling for multi-party democracy in China as chairman of the outlawed China Democracy Party, told AFP. "The imperial system was removed, but a totalitarian dictator stepped in. Mao Zedong was not an emperor, he was worse than an emperor, he was more of a dictator than the emperor." At an official event commemorating the centennial in Beijing, Chinese President Hu Jintao said the Communist Party is "the most faithful successor" to the spirit of the Xinhai Revolution. Hu then called on Taiwan to work toward reunification, urging China and Taiwan to "heal the wounds of the past and work together to achieve the great rejuvenation of the Chinese nation." In the run-up to the anniversary, China's state-run newspapers carried front-page articles on the 1911 uprising, but avoided any mention of its democratic aims. Chan's film, "1911", is similarly quiet on the subject.There have also been reports of academic events being cancelled or pressure placed on their organisers to avoid reference to the contemporary implications of the revolution's aims. The Wall Street Journal argued that “with the ideological heritage of communism neutralized by cronyism and corporatism, the CCP insists that the revolutions of 1911 and 1949 were powered by the elusive stuff of “nationalism.”"
"Wuhan has always been proud of the Wuchang Uprising and its contribution to China's development, but the people are actually very indifferent to it," said retiree Guo Xinglian as he strolled in a park near where the uprising began. "Today a lot of people think the Communist Party is more corrupt than the Qing Dynasty, but they also know that the Communist Party is very strong and any attempt at an uprising will be crushed." Traditional Chinese society was skilled in organizing the resources necessary for sustaining civil action---and uncivil if needed---against the government. The power of the Chinese public to mobilize fuels reform and creativity in China, while marking some real limits to government abuse. This continues to define the Chinese identity in the 21st century. Yet it is so loathed by the Chinese Communist Party that even the phrase "civil society" is banned online and in print. The 1911 revolution was also international in origin and orientation. Its leading figures, including Sun Yat-sen, had been raised at the margins of traditional China, or had spent their entire adult lives abroad---whether in the British colony of Hong Kong, the United States and its Pacific possessions, the European colonies of Southeast Asia, or the cities and universities of liberal Meiji Japan. They were accustomed to legal protections on political speech, the idea of impartial government and the prospect of democracy. After being banished from the Qing territories in the 1890s, reformers and revolutionaries traveled to or published in the Chinese communities of the Pacific, Latin America, North America and Europe to raise money for their cause. Not surprisingly, when the new republic was erected, its international orientation persisted, though it lost some credibility as Japan became financially and militarily more predatory. Nevertheless, collaborative relations with the United States, the Soviet Union and Europe (including the despatch of more than 100,000 men to support British and French armies in World War I) remained a defining element of the first Chinese Republic, and in many forms persisted in the P.R.C. until the late 1950s. China was part of the Qing empire, ruled by foreign invaders, the Manchus. The Chinese themselves had no armies, no defined boundaries and above all no concept of national sovereignty. At the end of the 19th century, as in the cases of many peoples entering the twilight of the great land empires, Chinese leaders arose who claimed the banner of nationalism. Their opposition to the Qing, British and French empires was clear enough. What was unclear was the basis of this nationalism once the Qing fell and the assaults of foreign empires withered away. However, the top-down reforms launched by the court throughout the 1900s were at the same time being outpaced by the growing radicalization of China’s intellectuals, many of whom spent this decade in Japan. While Kang Youwei’s idea of a constitutional, Confucian monarchy had appeared as revolutionary in 1898, by 1911 Kang was seen by most progressive thinkers and activists as a hopeless and eccentric reactionary. Even Liang Qichao, one of the most prominent and widely-read advocates of constitutionalism and an admirer of the British system, was outflanked by the cultural and political vanguard represented by activists like Zhang Binglin (Zhang Taiyan), the editor of the influential Minbao, published in Tokyo. 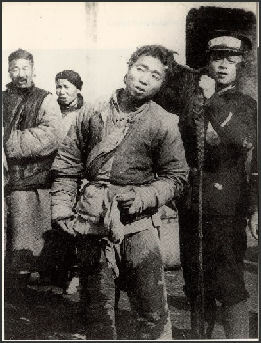 Zhang and many of his followers, in particular the group known as the “Tokyo anarchists”, criticized what they saw as the pro-Western bias in the institution-building process and advocated a different kind of democracy, rooted in social equality and inspired by archaic and often esoteric Chinese thinkers. The 1911 revolution, whether because of the initial weakness of its proponents or through a series of unlucky historical coincidences, rapidly led to the restoration of Yuan Shikai to the imperial throne. The long-anticipated democratic system and the greater social and civic equality that was to result from it remained elusive, prompting a decade of soul-searching among China’s intellectuals. The most famous product of these reflections was without doubt Lu Xun’s Ah Q, the epitome of a revolutionary who is unequipped and unable to become a citizen. How were China’s Ah Qs to be made into citizens” This became the foremost preoccupation of the country’s intellectual elite for many years, setting them apart from the world of power politics. The New Culture movement, with its emphasis on education and individual autonomy, was followed by cultural agendas that became increasingly utopian as politics became more cynical and polarized. When Duan Qirui sent his troops into Beijing, Lu Xun’s brother Zhou Zuoren took his Beijing University students to study in the countryside, emulating the Japanese “New Village movement.” As Chiang Kai-shek massacred supposed communist sympathizers, Liang Shuming set up utopian rural schools in China’s remote backwaters. “Real” democracy was always seen as outside the corrupt institutions of party politics; however, the utopian vision of “fostering citizens” never led to the desired changes in the political system. Similarly to Weimar Germany, the Republic of China was a time of great freedom and intellectual ferment, but also a Republic without republicans, a regime whose institutions no one was prepared to invest in. In this manner, mistrust of institutions remained strong among critical Chinese intellectuals for most of the century, and was notably instrumentalized to great effect by Mao during the Cultural Revolution---which is not to say that “organic” intellectuals did not crave recognition from the state when the opportunity arose. However, it was only after the beginning of Reform and Opening up that the Chinese elite again warmed to the theme of institution building: throughout the 1980s---a decade of intellectual ferment and political reform in many ways similar to the 1900s---the feeling dominated that an institutional compromise was possible between inner-Party reformers and idealistic intellectuals. After the violent crackdown of the 1989 student movement, a similar pattern emerged: rather than embarking on an uncertain long march through the institutions, many of China’s foremost critical thinkers once again took refuge in other realms: academia, legal activism, grassroots civil society organizations, personal investigations of recent history, documentary films, or emigration. Only Liu Xiaobo, loyal to the spirit of the 1980s, reaffirmed his commitment to formulating an institutional alternative, demonstrated most clearly in the Charter 08 he co-authored. On the whole, however, institutional reform was seen as both hopeless and useless (a point tragically demonstrated by Liu’s arrest) and the real battles were elsewhere. It took almost one century from the fall of the Bastille until French citizens of all political stripes could to come together at the funeral of Republican icon Victor Hugo, a sign, according to historian François Furet’s famous pronouncement, that “Revolution had entered port.” This has not happened in China. To the contrary, the opening ceremony of the Beijing Olympics in 2008, with its carefully crafted historical narrative, took great pains to avoid sketching out a possible political consensus on how to define the nation in the 20th century, closely confining itself to the cultural bric-a-brac of its “5,000-year history.” This absence of even a minimal consensus on the nature of the Chinese polity speaks eloquently to the open legacy of 1911. One hundred years on, the divide between an institutional apparatus that seems less and less amenable to reform and an aspirational form of democracy that has not yet found a satisfactory institutional translation on the Chinese mainland remains as deep as ever. “Jonathan Spence, a historian, writes that Liang Qichao—the pre-eminent Chinese intellectual of the era, an erstwhile monarchist and at that moment a close ally of Yuan’s— had come back to China to help organise a pro-Yuan party. He took this defeat for the authoritarians terribly, writing to his daughter, “What can one do with a society like this one? I’m really sorry I ever returned.” Disgusted, and believing his opponents had cheated, Liang would temporarily throw in his lot with Yuan’s rule, even as evidence suggested the president had assassinated his chief political rival. Ever the operator, Yuan worked to reverse the Nationalist victory at the polls by buying off elected officials, later banning the party altogether. Might Song have saved the Republic by living? If he had not been assassinated, some scholars believe, Sun would not have attempted his second revolution, and Yuan would have continued as an incorrigible president with too much power—a disappointing outcome, but not as catastrophic as the country’s slide into anarchy proved to be. In this alternative history, China might have followed the path that Taiwan later did, with a militarised, authoritarian government slowly evolving into a liberal republic. The crucial question was whether Yuan could ever have been persuaded to tolerate Song. Could Liang have overcome his own bitterness about the election result to negotiate a peace between them? Could Song have patiently worked to build a government that would live longer than its president? p> Text Sources: New York Times, Washington Post, Los Angeles Times, Times of London, National Geographic, The New Yorker, Time, Newsweek, Reuters, AP, Lonely Planet Guides, Compton’s Encyclopedia and various books and other publications.